Kelley Blue Book is coming to Australia. Did you know that the price of the same car can vary considerably? That's because factors such as odometer reading, equipment and colour can directly impact the value of cars. With so many variables, itʼs difficult to know the right price to pay for a car. Bringing almost 90 years of experience in creating vehicle valuations to consumers in the USA, Kelley Blue Book is here to build a product that helps you understand price and have more confidence in buying a car. Kelley Blue Book began in the USA in 1918 when Les Kelley started the Kelley Kar company. After years of successfully running the car company, Les Kelley introduced the Kelley Blue Book in 1926. 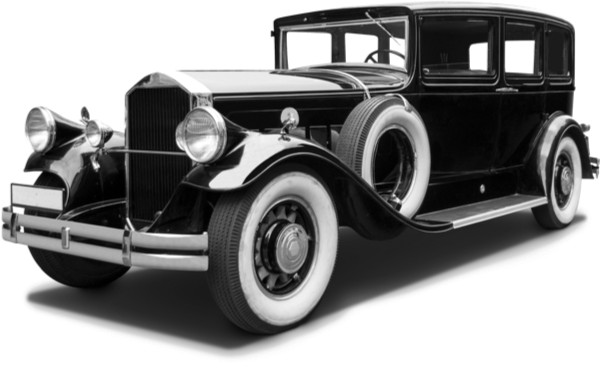 Les Kelley was so successful at selling cars that he constantly needed more cars for his lot; he began distributing a list of automobiles he wanted to purchase with the prices he was willing to pay for them to dealers and banks. Soon, the automotive community trusted his judgement as a good reflection of current values. Other dealers and banks requested the list for their own use and the Kelley name became the most trusted for car values. This list later became known as the Kelley Blue Book. In 1918, a young man named Les Kelley parked three Model T Fords in an open lot, put $450 in the till and started the Kelley Kar Company. It was to become the largest dealership in the world and, along the way, spawn a need for placing values on used and even new cars, know as Blue Book ® values. Banks and dealers have now become so dependant on Kelley’s value that he decides to begin publishing them in book form. The Blue Book of automotive vales is born. World War II brought with it a shortage of cars. Used car prices got so high the government decided to put a ceiling on prices and used the Blue Book as the ceiling for both wholesale and retail values. Kelley Blue Book continues innovating by being the first publication to use mileage to determine a vehicle’s value. A game-changing innovation, Kelley Blue Book launches KBB.com. New car prices introduced first, then used car values in 1996. 20,000 visitors a month used KBB.com. KBB.com becomes the most visited automotive website 1997. 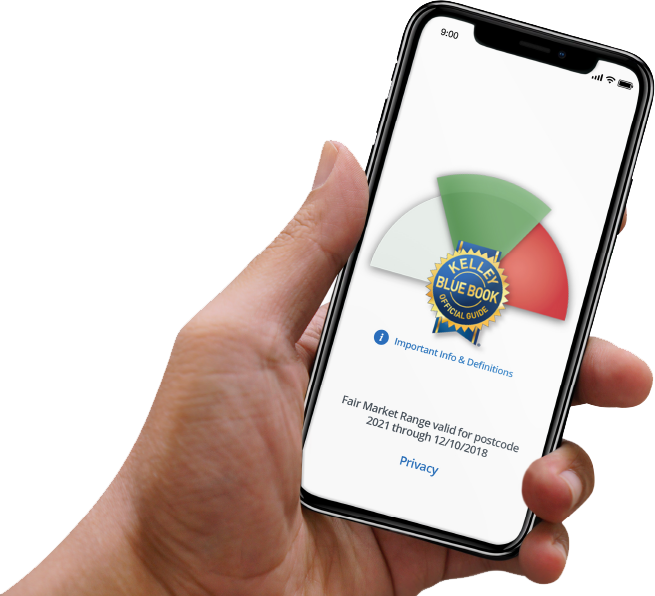 Kelley Blue Book launches the Kelley Blue Mobile App helping customers determine their current vehicle’s worth, check proces for their next one or find a local dealer. We analyze daily market data from and listings to come up with the Kelley Blue Book Fair Market Estimate Range. Kelley Blue Book Price Advisor is a good way to cut through the internet information chaos and discover the fair market estimate range when shopping for a used car. Giving you the confidence you made the right purchasing decision. Circumstances such as retiring model years, unpopular colour, excess inventory and seasonality may all be contributing factors to sales that occur in this range. The green zone represents the Kelley Blue Book® Fair Market Estimate Range, which is Kelley Blue Book’s estimate of what a consumer can reasonably expect to pay for a vehicle. Circumstances such as exceptionally low supply with high demand, options installed by the dealership, and seasonality may all be contributing factors to sales that occur in this range. With so many brands, models and variables, it is easy for a buyerʼs car choice and pricing expectations to get buried under information overload. Let the Kelley Blue Book® Price Advisor help you - help them find a fair market estimate. For some, it may be an easy journey finding what they want, but for others it can be confusing and frustrating. Lack of confidence in their research and understanding can be a barrier in them reaching out to a dealership. Kelley Blue Book provides independent, transparent estimating, short circuiting the research process for consumers helping them to take the next step and contacting the dealership. Once you know each of the Kelley Blue Book® Price Advisor zones and why vehicles are estimated within those zones, you’ll have more confidence to be able to share this information with your customers, be able to speak a shared language and respond to any questions or concerns your customers have. To help you speak the same Pricing languagewith your customers. Welcome to the websites and services owned or operated by Cox Australia Media Solutions Pty Ltd (CAMS AU) including carsguide.com.au (Carsguide), autotrader.com.au (Autotrader), kbb.com.au (Kelley Blue Book) (“Sites”). These are the Terms & Conditions for your use of the Sites which you may access in several ways, including but not limited to the web, PDAs, mobile phones and RSS feeds. These Terms & Conditions apply whenever you access any Site, regardless of how you access a Site. When you use a Site, You agree to be bound by these Terms & Conditions, which are subject to change at CAMS AU's sole discretion. Your use of and access to a Site indicates your acceptance of these Terms & Conditions, as they exist at that time. All intellectual property in relation to content on these Sites belongs to CAMS AU or its licensors, advertisers or affiliates. You obtain no interest in that intellectual property. All content on the Sites are protected by Australian and international copyright and other intellectual property laws. You may not do anything which interferes with or breaches those laws or the intellectual property rights in the content. CAMS AU’s logos, such as the Carsguide trade mark, the Autotrader trade mark and the Kelley Blue Book trade mark, are registered trademarks of CAMS AU or its related bodies corporate. Other trademarks may be displayed on the Sites from time to time. These may belong to third parties. Nothing displayed on any Site should be construed as granting any licence or right of use of any logo, trademark or masthead displayed on a Site without the express written permission of the relevant owner. • use any content from a Site in a way that otherwise violates any of the terms and conditions from a Site, including but not limited to use in a way that would infringe the intellectual property rights of CAMS AU, any of its related entities, or any third party. CAMS AU may, in its absolute discretion, terminate your right to use a Site if it considers that you or any related party (including any company of which you are a director) have breached these terms and conditions or otherwise acted in a way that is injurious to CAMS AU or any related entity. CAMS AU also expressly reserves the right to take whatever other action it deems necessary to protect its interests or the interests of its related entities. CAMS AU does not exclude any rights and remedies in respect of goods or services under the Competition and Consumer Act 2010 (Cth) or equivalent State or Territory legislation which cannot be excluded, restricted or modified. However, CAMS AU excludes all rights, remedies, conditions and warranties in respect of goods or services from your use of any Site whether based in statute, common law or otherwise to the extent permitted by law. (a) CAMS AU does not warrant the accuracy of the content on its Sites. The content is provided to you "as is" and on an "as available" basis and on the condition that you undertake all responsibility for assessing the accuracy of the content and rely on it at your own risk. All content on any Site may be changed at CAMS AU's sole discretion and without notice. In particular CAMS AU gives no guarantee of continued availability of any particular motor vehicle or part advertised on any Site and CAMS AU accepts no responsibility for any information regarding motor vehicles or parts as they appear on any Site. You acknowledge that CAMS AU has no control over the quality, safety or standard of motor vehicles or parts advertised on a Site or the truth or accuracy of the information contained on any Site (including in any listings or other advertisements) and that any information provided on a Site and any illustrations or photographs displayed on a Site are solely for guidance and are not to be relied on. Further, CAMS AU does not warrant that notices or advertisements will appear on a Site according to instructions. (b) CAMS AU does not warrant that functions contained in any Site content, such as hyperlinks, will be uninterrupted or error free, that defects will be corrected or that CAMS AU or the server that makes it available, are free of viruses or bugs. (c) Liability of CAMS AU, for any breach of a term or condition implied by law is limited at CAMS AU's discretion, to the supply of any service again or the payment for the cost of having any service supplied again. (d) You indemnify CAMS AU and its affiliated companies, and each of their directors, officers, employees and agents against any direct or indirect damages, action, claim, loss or expense in contract, under statute or in tort (including negligence) which it incurs which arises from your use of a Site. The Sites may include third party content which is subject to that third party's terms and conditions of use. Nothing on the Sites should be construed as granting any licence or right for you to use that content. The Sites may include links to third party sites which are not related to CAMS AU and in relation to which CAMS AU has no control or interest. The appearance of those links on any Site does not indicate any relationship between CAMS AU and that third party or any endorsement by CAMS AU of that third party, its site or the products or services which it is advertising on any Site. When you submit content to CAMS AU in any format, including any text, photographs, graphics, video or audio, you grant CAMS AU a non-exclusive, royalty-free, perpetual licence to publish that content. You agree that CAMS AU can use that content in any way, now and in the future. CAMS AU also reserves the right not to use the content you submit. You warrant that you have all of the necessary rights, including copyright, in the content you contribute, that your content is not defamatory, that it does not infringe any law including but not limited to competition and consumer legislation, fair trading legislation, motor dealer legislation, privacy, confidentiality and intellectual property law and that you have not impersonated any person or entity or falsely stated or otherwise misrepresented their affiliation with a person or entity or forged any TCP/IP packet header or any part of the header information in any email or newsgroup posting. You indemnify CAMS AU against any and all legal fees, damages and other expenses that may be incurred by CAMS AU as a result of a breach of the above warranty. You waive any moral rights in your contribution for the purposes of its submission to and publication on any Site. You acknowledge that the Sites may provide access to live chat boxes which are owned and operated by third parties unrelated to and unaffiliated with CAMS AU. CAMS AU has no control over the content posted by you or any other third party (such as a dealer) in any live chat box. To the maximum extent permitted by law, CAMS AU disclaims all responsibility and liability to you for your use of any live chat box on the Sites. By submitting any rating, review, question or answer on any Site, and in addition to the representations and warranties outlined above, you further represent and warrant that: you are the sole author of that content; you voluntarily waive all moral rights you may have in the content; you assign all intellectual property rights in the content to CAMS AU; the content you post is accurate; you are at least 18 years old; and the content does not otherwise violate these Terms and Conditions, or otherwise cause injury to any person or entity. You agree to indemnify and hold CAMS AU (and its officers, directors, agents, subsidiaries, joint ventures, employees and third-party service providers, including but not limited to Bazaarvoice, Inc.), harmless from all claims, demands, penalties, loss and damages (actual and consequential) of every kind and nature, known and unknown including reasonable attorneys' fees, arising out of a breach of any representations and warranties set forth in these terms and conditions, or your violation of any law or the rights of a third party. • You acknowledge that prices of vehicles provided on the Sites normally exclude government and statutory charges, unless otherwise stated. • CAMS AU may, at its discretion, refuse to pass on a lead to an advertiser if it believes the lead may infringe the rights of any person or may not comply with all or any laws and regulations. • Payment calculators that may appear on the Sites are estimates only for indicative purposes and do not necessarily reflect any interest rates or terms currently in the market. • You will not use any Site for any purpose or in any way which is unlawful. • These Terms & Conditions shall be governed by and interpreted in accordance with the laws of Victoria. Carsguide.com.au and Autotrader.com.au has made it easier for you to contact motor vehicle dealers by introducing 1300 telephone numbers. Generally, local call charges apply to calls to these 1300 numbers, however higher charges for calls from mobile phones may apply. Please contact your telephone service provider for more detailed information on charges to 1300 telephone numbers.